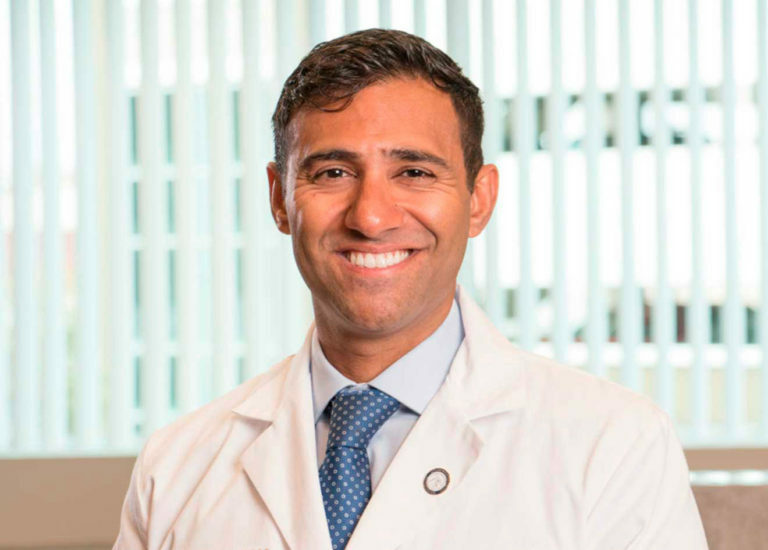 Dr. Verma is a leader in the treatment of adult and pediatric spine patients with various forms of spinal anomalies including scoliosis, kyphosis, flatback syndrome and spondylolisthesis. He operates on the spine from occiput to the pelvis. He also specializes in innovative cervical spine procedures and minimally invasive procedures. He received his undergraduate degree in biomedical engineering from Cornell University and went on to obtain both a medical and master’s degree from New York University, where leading scoliosis surgeons mentored him. He completed residency at the prestigious Rothman Institute and DuPont Hospital for Children, one of the most sought after residencies in the country. Dr. Verma then completed a spine fellowship at the University of California in San Francisco, known as a premier institution for adult and pediatric spinal deformity. Dr. Verma was also an Assistant Professor at the University of Washington, where he built a multidisciplinary spine deformity service. Over the last 10 years, Dr. Verma has also volunteered his services in Africa, Columbia, and Mexico to perform complex pediatric spine surgery through the FOCOS and Global Spine Outreach Foundation. Dr. Verma maintains an interest in clinical research and has authored over 150 publications, book chapters, and research presentations presented internationally. In 2010, he was awarded the prestigious Russell Hibbs award by the Scoliosis Research Society (SRS). This is the oldest and most prestigious spine society, whose single focus in the advancement of scoliosis care around the world. He was nominated for the award in 2012 as well. His research has been presented at the Scoliosis Research Society, North American Spine Society (NASS), Pediatric Orthopaedic Society of North America (POSNA), and other meetings. Much of this work has been published in the Journal of Bone and Joint Surgery (JBJS), Spine Deformity, Spine, and other journals. He is an reviewer for several journals as well. Dr. Verma prides himself on explaining the disease process and reviewing imaging with patients. Most spine problems are successfully managed without surgery. When non-surgical treatments are not helpful, he helps his patients develop a customized treatment plan. Dr. Verma believes in evidence based medicine and the personalized care of private practice. He has relocated from Seattle to Southern California to be closer to family. He operates at Los Alamitos Medical Center, Long Beach Memorial Hospital, and Miller Children’s Hospital. Great Doctor and Surgeon! Dr Verma is greatly involved in his patients success. The care he provides before and after surgery is exceptional. Dr. Verma, Thank you and your team for everything you all have done for our daughter. At 14 years old I cannot begin to tell you how many people ask “why didn’t you to to Children’s?” My answer is always simple.. It’s your personal care and attention to detail. You treater her as though she was your own and for that we cannot thank you enough. Dr. Verma, You change the quality of life for those that have suffered like Pat. Never change who you are and how you practice medicine. You are a miracle worker not to mention a fabulous person.